﻿National Cheesecake Day: Calendar, History, Tweets, Facts, Quotes & Activities. National Cheesecake Day is a day of appreciation for the cheesecake dessert. Based on the discovery of cheese molds, it is believed that cheesecake originated in ancient Greece. Athenaeus, a Greek writer, is credited with the first cheesecake recipe, which only used basic ingredients such as cheese, flour and honey. After the Romans conquered Greece, cheesecake recipes began to include eggs and baking time. With the passing of time, cheesecake ingredients were modified to resemble the finished product we know today. However, the use of cream cheese is an entirely American version of the cheesecake, one that has evolved to consist of an uncooked cream cheese filling on top of cookie or graham crackers, while English cheesecakes are cooked to completion and have a dry texture. This scrumptious national holiday occurs every year on July 30th. According to Guinness World Records, the largest cheesecake ever made weighed 6,900 pounds and was created by Philadelphia Cream Cheese in Lowville, New York, USA. Arnold Reuben, owner of the Turf Restaurant in NYC, created the New York Style cheesecake in 1929. This cheesecake is not served with any fruit or sauce, but has a smooth-taste from the extra number of egg yolks that are added in the cream cheese mixture. Pretty in Pink Cheesecake by Elegant Cheesecakes of Saks Fifth Avenue is one of the most expensive American cheesecakes. The cheesecake weighs 8 pounds and is shaped as a stack of gift boxes, each made of edible chocolate wrapping, while the cheesecake is made of chocolate decadence layered with health crunch in vanilla and chocolate butter cream. The price tag for this cheesecake is $325. In 1972, Evelyn and Oscar Overton moved to Los Angeles and opened The Cheesecake Factory Bakery to sell Evelyn's cheesecakes. Today, The Cheesecake Factory has become a $2 billion global company with restaurants all across the States and in the United Arab Emirates, Kuwait, Qatar, Saudi Arabia, Lebanon and Mexico. Try baking a Japanese or English cheesecake. Japanese cheesecakes have a soft, light and cottony texture, while English cheesecakes are cooked and served with a fruit compote. Enjoy a discounted or free cheesecake from your favorite cheesecake restaurant. 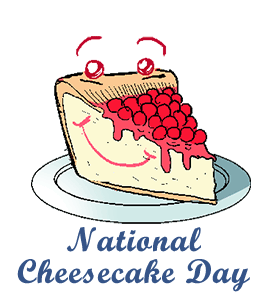 Many restaurants offer discounts and samples of cheesecake on National Cheesecake Day. Host a cheesecake potluck. Each guest must bring one cheesecake of his/her own creation. All guests may then indulge in each other's delicious creations and try a wide new variety of cheesecake flavors. According to the USDA, every 100g of cheesecake contains 321 calories with a total fat content of 23g. To try a healthier alternative, bake a cheesecake using Greek yogurt instead of cheese. Participate in the Kona Cheesecake Run, held on April 17, 2016 in Farmington Hills, Michigan. Cheesecake samples at the run are provided by The Cheesecake Factory Novi.